ComiXology has added two new features to make it easy for shoppers to spend lots of money on digital comics: Subscriptions and Bundles. The subscription is basically an automatic purchase of every new issue—it doesn’t include back issues, collected editions, or the current issue of the comic, and it doesn’t seem to include a discount, either. Basically, every time a new issue of the comic comes out, comiXology will charge your credit card and send you an e-mail saying the issue is ready to download. Subscriptions can only be set up on the comiXology website, but of course the comic will sync across all platforms so you can read it on any device. This seems like a useful service for hard-core comics fans, and it’s a shrewd move on comiXology’s part because readers will be paying full retail price for these comics—unlike those who wait a month or two for the price to drop. Users can cancel at any time, but like most “negative option” services, this one holds the potential for you to rack up a lot of charges if you forget you subscribed (admittedly, not a likely scenario for most serious comics fans). 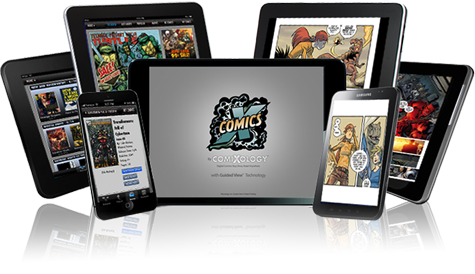 Right now, comiXology is offering subscriptions to 543 different comics, although they seem to have simply applied it to every series, without looking at whether new issues are still coming out. For instance, you have the option to subscribe to The Secret History of D.B. Cooper, but the series ended after issue #5 so unless something changes, you won’t be getting any e-mails about it. If you’re more interested in getting a deal than getting the latest issue, the bundles may be the way to go. These are just what they sound like, a group of comics sold together at a discount compared to what you would pay for them individually—at full retail price. They seem to be designed to encourage you to buy more, though. For instance, the Adventure Time Bundle consists of the first three issues of three different six-issue series, so presumably you’ll be back to buy the rest one issue at a time. Still, it’s nine comics for $11.99, which is a good price. The Image Collections Starter Bundle includes the first volumes of five different series—The Manhattan Projects, Revival, Saga, Fatale, and Peter Pfanzerfust—so that’s a lot of pages for $35.99, but it’s only 16% off what you would pay for the individual volumes. On the other hand, the Valiant bundle, for those who are still wondering what all the fuss is about, launches you into five series at less than half the price of the single comics, or about $1.50 a comic, if you want to look at it that way. Just poking around a bit, these bundle prices seem to compare favorably to other e-books or even print editions, unless there’s a steep discount involved. And while some are starter packs, others give you a set of complete stories at a good price, such as the Richard Stark’s Parker Omnibus (three of Darwyn Cooke’s adaptations) for $25.99 or the Archaia Digital Firsts, a set of seven graphic novels for $39.99. And there’s some Marvel stuff, too. These new features come in addition to the improvements added in the latest release of their iOS app, which allow the reader to fit the comic to the width of the screen and view two pages at once in landscape mode.